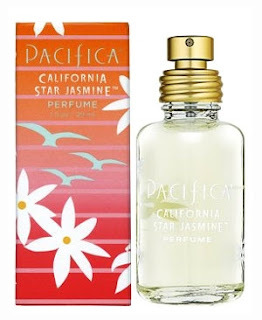 I wasted my afternoon skin glow on trying California Star Jasmine by Pacifica. A perfume so bland and synthetic-smelling that I don't even know why anyone would bother to create something like that. The rest of the line is rather fun and well-done, with some gems (Spanish Amber and French Lilac), and we all know it's possible to create a great scent for under $25 (Old Spice, anyone? ), but I wouldn't even waste a dollar on a roll-on of this (and this runs for $11.99). It can't even pass as a decent fake jasmine... And any resemblance to driftwood in the dry down makes one question the copywriter's state of mind. In any case, my search for jasmine continues.